On the latest Motif++ 1.0.7, we have implemented some experimental C++ classes (OpenGL++) for OpenGL. To display various OpenGL graphics objects on X11/Motif windows, we have introduced OpenGLView class based on Canvas class of the Motif++. 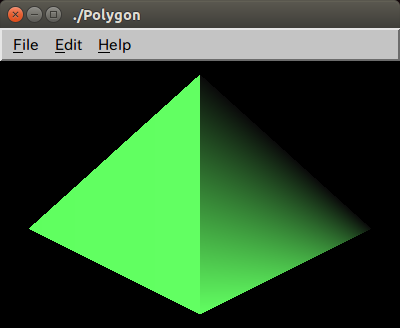 The following Polygon program is an example to display a polygon on SimpleView class derived from OpenGLView. //2016/08/27 Updated to use OpenGLApplication instead of Application. //This method will be called from an expose callback of OpenGLView. //This method will be called from a structureNotiy event handler of OpenGLView. //Write your own resize procedure. //This method will be called from a mapNotify event handler of OpenGLView.